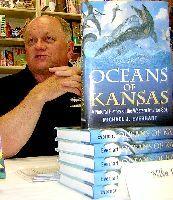 OCEANS OF KANSAS - A Natural History of the Western Interior Sea. 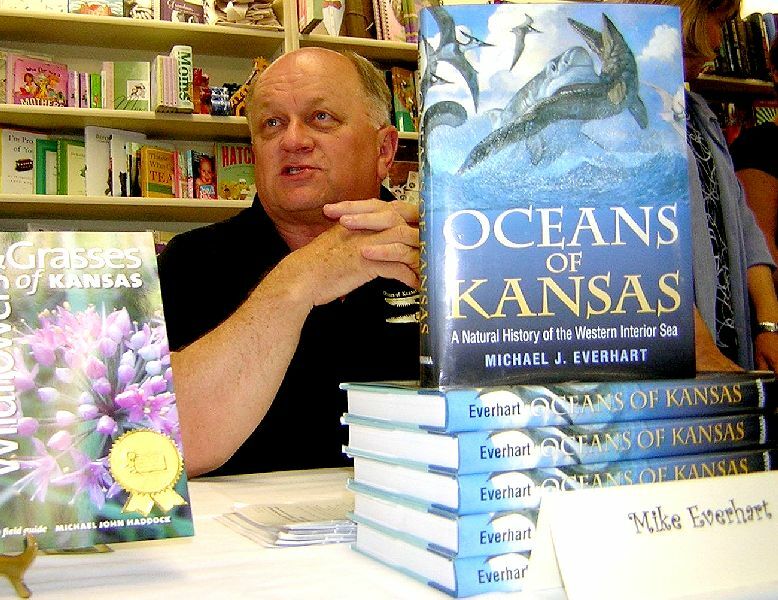 There are so many people who, over the years, have helped me learn and understand the paleontology of Kansas during Late Cretaceous that it is difficult to know where to begin in expressing my appreciation. You’ve all heard the adage that it takes a village to raise a child. I can certainly testify that it also takes one to write a book. First, I thank my wife, Pamela Everhart for her support and companionship (not to mention her superior ability to find interesting things for me to dig up) in the field. She was also properly impressed when I brought a mammoth tooth to class while we were in high school. This book and a lot of other projects in paleontology would not have been possible for me without her. The rest of the list follows in no particular order. My fifth grade teacher, Vivian Louthan, encouraged my interest in “rocks” and took me to a gem and mineral show that left a lasting impression. John Ransom, Harry Rounds and Don Distler, among many other teachers, guided my interest in the study of living things, and the remains of things that lived millions of years ago. Paul Tasch introduced me to the Smoky Hill Chalk on a vertebrate paleontology field trip in 1968 and I immediately was hooked on it. David Parris, Barbara Grandstaff and J. D. Stewart were all supportive as well as being excellent teachers and resources of otherwise unknown and mysterious information when we were getting started in our serious study of the Smoky Hill Chalk in the late 1980s. Although he may not remember it, David Parris sponsored my membership in the SVP many years ago. I owe a major debt of thanks to J. D. Stewart and Donald Hattin for our continuing discussion of the stratigraphy of the Smoky Hill Chalk. Pete Bussen has been a source of valuable information on history, paleontology, weather, and a variety of other useful subjects which he gained in his pursuit of his “Doctor of Disagree-ology” degree. I have found that Pete has a learned opinion on just about everything, whether I asked for it or not. A number of landowners in western Kansas , including the Albins, Birds, Babcocks, Bentleys, Bodeckers, Bonners, Cheneys, Collins, Millers and Surratts have generously allowed us access to their property over the years and obviously made many of our discoveries possible. Richard Zakrzewski, Larry Martin and Ken Carpenter made the collections in their charge available for study, and provided guidance and answers to even more questions. Their friendship has always been appreciated. Richard Zakrzewski assisted in getting my appointment as an Adjunct Curator of Paleontology at the Sternberg Museum . Dale Russell, Gorden Bell, Jim Martin, Bruce Schumacher, Kenshu Shimada , David Schwimmer, Glenn Storrs and David Cicimurri indulged me in discussions of a variety of subjects, but mostly mosasaurs, plesiosaurs and sharks. Earl Manning , in particular, has been a wonderful resource of useful information on identification of specimens, reference material, historical issues in paleontology, and general all around common sense. At one time or another, Bob Purdy, Michael Brett-Surman, Earle Spamer , Ted Daeschler , Charles Schaff , Desui Maio, Michael Morales, George Corner, Greg Liggett and many others have helped me track down fossils that originated in Kansas. Dan Varner, Doug Henderson, Russell Hawley and other artists have provided me with their enlightened reconstructions of a lost world I can only dream about. Steve Johnson’s questions regarding a few mosasaur vertebrae led us both to a once in a lifetime discovery. The time spent in the field with Tom Caggiano, Steve Balliett and Andy Abdul has been as educational for me as I hope it has been for them. I will always “owe” Tom Caggiano for his discovery of the missing dinosaur foot. Shawn Hamm and Keith Ewell dragged me “kicking and screaming” into the study of fossil sharks from other formations in Kansas . A number of anonymous reviewers and some who aren’t anonymous have made me aware (tactfully, of course) of my short-comings as a writer and paleontologist – their assistance has been invaluable to me and I hope they see that I learned something in the process. Access to the Internet has allowed me to meet and converse with co-workers in distant places that I will probably never meet in person. Nevertheless, I count them as good friends and thank them for their help over the years. A variety of library people from all over the world, including Angie from Kansas, and Steve from New Zealand, have helped me to accumulate necessary paleontology reference materials, some of which are extremely rare or difficult to find.